The transport industry is a vital partner in the response to HIV/AIDS. It moves millions of people every day, both within, across borders and beyond boundaries. These movements can become a powerful channel for challenging stigma, discrimination, disseminating the information, knowledge and understanding on which effective prevention depends. Along with the government and other civil society organizations, transport workers’ unions can play a significant role in controlling the pandemic. That’s why we support the Worlds AIDS Day campaign, started by the World Health Organization in 1988. 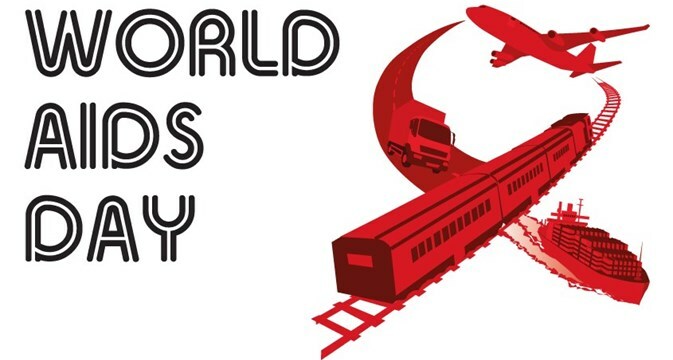 We believe that, with the organisational strength of over 16.5 million transport workers through 694 affiliated unions in 149 countries, we can make a difference and keep transport workers and their families healthy and protected from HIV/AIDS. The next World AIDS Day is 1 December 2017. Find out how you can get involved. World AIDS Day is recognised and observed by millions of people in more than 190 countries around the world. Globally an estimated 34 million people have HIV. Today, many scientific advances have been made in HIV treatment, there are laws to protect people living with HIV and we understand so much more about the condition. But despite this, people do not know the facts about how to protect themselves and others from HIV, and stigma and discrimination remain a reality for many people living with HIV. World AIDS Day is important as it reminds the public and government that HIV has not gone away – there is still a vital need to raise money, increase awareness, fight prejudice and improve education.